Species of Coccobius are small (less than 2-mm) chalcid wasps currently placed in the in the subfamily Coccopahginae with the family Aphelinidae. They are parasitoids on armored scales (family Diaspididae). Like their hosts, they are nearly cosmopolitan in distribution, with most species occurring in the old world tropics. There are currently 80 described species of Coccobius, though additional exploration of the new world tropical fauna may reveal many new species. Apparently, Coccobius remain closely associated with the scale insect hosts, and consequently are not usually collected in large numbers via typical bulk collecting methods (pan traps, malaise traps, sweep-netting, etc.). Sampling efforts based on collecting diaspidid scales and rearing their parasitoids will likely yield new species and range extensions for old species. Coccobius is among the genera of Aphelinidae exhibiting heteronomous life histories. For species where the life histories are known, females develop as primary endoparasitoids of diaspidid scale insects, whereas males are hyperparasitoids of conspecific females (autotrophic arrhenoparasitism) or females of other species (heterotrophic arrhenoparasitism). Males may be ecto- or endoparasitic on their hymenopterous hosts. The effect of this life history on the efficacy of biological control is an active area of research. Given the large number of scale pests throughout the world, it is not surprising that Coccobius species have figured in several biological control programs. 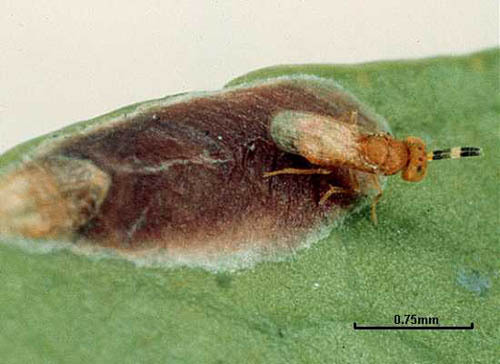 Comstockiella sabalis, a pest scale on palms in the southeastern United States and several Caribbean Islands, is largely under biological control by Coccobius donatellae, among other parasitoids (Evans and Pedata, 1997). Coccobius species have also been used in biological control programs targeting euonymous scale (Unaspis euonymi, a pest of woody ornamentals) in New England (Van Driesche et al., 1998), and the pine scale (Hemiberlesia pitysophila) in China (reviewed in Yan et al., 2001). The study of interactions between Coccobius fulvus and the arrowhead scale (Unaspis yanonensis) has yielded insight into host-finding stimuli and parasitism avoidance behaviors in the scales (Matsumoto et al., 2004). We are in the early stages of developing our Coccobius research program. Recent molecular studies have suggested that Coccobius may not belong within the coccophagine aphelinids, and we hope to elucidate their placement within the Chalcidoidea. We also propose to generate of key to the world species of Coccobius, and a revision of the new world species. Evans, G. A., and P. A. Pedata. 1997. Parasitoids of Comstockiella sabalis (Homoptera: Diaspididae) in Florida and description of a new species of the genus Coccobius (Hymenoptera: Aphelinidae). Florida Entomologist 80:328-334. Matsumoto, T., T. Itioka, and T. Nishida. 2004. Why can arrowhead scales, Unaspis yanonensis Kuwana (Homoptera: Diaspididae), which burrow and settle below conspecifics, successfully avoid attack by its parasitoid, Coccobius fulvus Compere et Annecke (Hymenoptera: Aphelinidae)? Applied Entomology and Zoology 39:147-154. Van Driesche, R., K. Iodoine, M. Rose, and M. Bryan. 1998. Release, establishment and spread of Asian natural enemies of Euonymus scale (Homoptera: Diaspididae) in New England. Florida Entomologist 81:1-9. Yan, X., L. Zhenyu, W. P. Gregg, and L. Dianmo. 2001. Invasive species in China - an overview. Biodiversity and Conservation 10:1317-1341.